Now, I didn't need any urging to be optimistic about climate change. 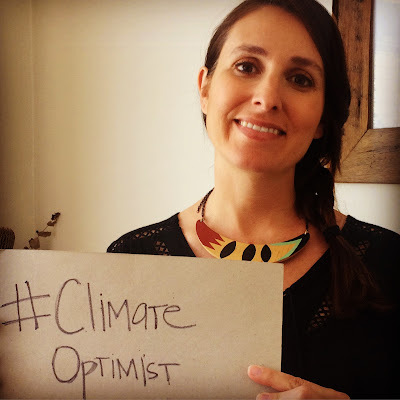 Despite all the bad news that surrounds climate change, including the impacts already happening like increased extreme weather events around the world and climate refugees, I've been an optimist ever since I became an environmentalist. 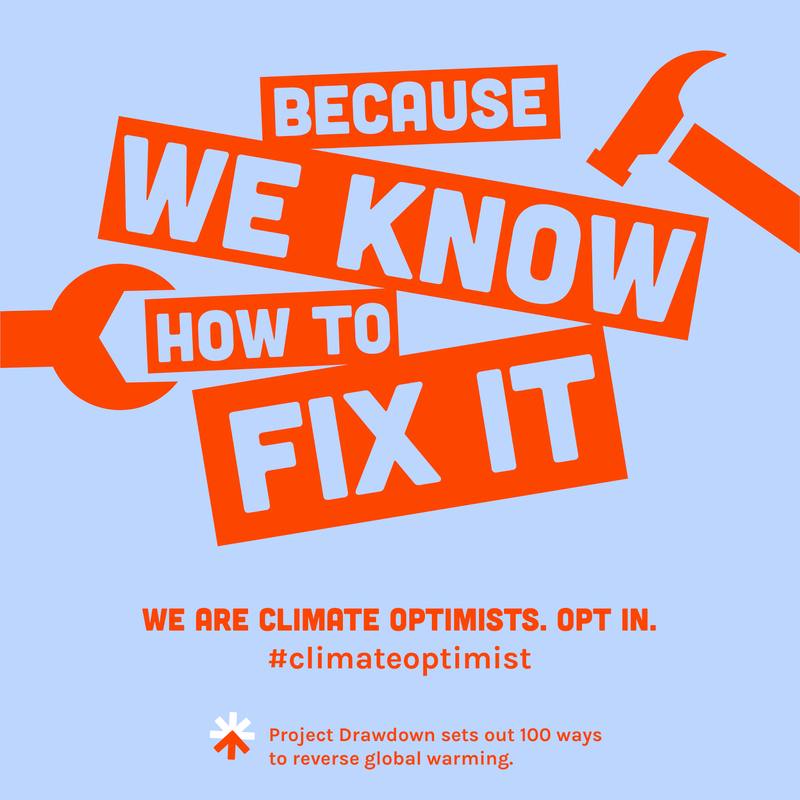 Actually, I think that it's because I'm an active environmentalist that I am an optimist. I feel incredibly privileged to have met countless innovators and changemakers through my work, including through the green building industry, the sustainable fashion movement, and the many climate and renewable activists I've met along the way. I know people who have launched social enterprises that recycle used fishing nets into skateboards and sunglasses, created transparent and ethical supply chains for textiles, made apps to help people shop more ethically, invented sustainability roles for themselves, and worked with big business and government to address larger systems and institutions. 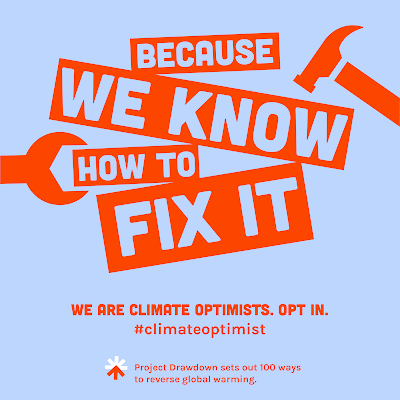 Simply put, there is so much activity, and so many people working on solving the climate (and other environmental) crisis, that there is no reason not to be an optimist. Australia's energy-related emissions decreased 2.3% in the year to June 2017, this brings us to 9.1% below 2005 emissions and 0.8% below 2000 emissions. Furthermore, emissions per capita are at the lowest level in 27 years, down 34.2% since 1990. Read all the details on the Australian Department of Environment and Energy website. A global energy transition is underway. Renewable energy has grown by record levels once again in 2016, up 10% from the 2015 record to 161GW, and costs less each year, 23% reduction in investment compared to 2015. There is more investment in renewables than any other energy form. In the US, after Donald Trump announced pulling out of the Paris Climate Accord, a number of cities and businesses pledged to meet the commitments. Australian researchers have identified 22,000 sites for pumped hydro energy storage to address renewable energy storage concerns. The Leonardo DiCaprio Foundation just awarded $20 million in environmental grants (as if I needed another reason to love Leo). Fossil fuel companies are being taken to court by children, cities and states to pay the damages of climate change because the industry knew about the link between fossil fuels and climate change and failed to act (similar to the tobacco industry cases). The Australian green building sector has decreased emissions by 62% and potable water use by 51% (compared to traditional building standards). Interest in sustainable fashion is rapidly growing. I don't have any quantitative stats to share on this, however, given my own involvement in the movement (and my recently completely PhD research) I can attest to the increased interest from consumers, governments, industry and educational institutions. While not directly connected to climate change (though the production, use and disposal of clothing certainly adds to emissions), this growing interest in sustainable fashion signals growing concern and awareness of all environmental issues, and shows that a broad range of individuals care about these issues and want to play a part in the solution. In short - passion and innovation change the world, and I see no shortage of either. but there are too many to list. I wouldn't be true to my activist self if I didn't add a final caveat: just because I am optimistic does not mean we can be complacent. We have a lot of work to do, and we need all hands on deck - citizens, businesses and governments. So while I am optimistic - and I hope you feel optimistic, too - I don't want to give the impression our work here is done. What do you think? Are you a climate optimist? Why? Why not? I'd love to hear from you, so let's keep this important discussion moving.